There is a long list of amazing local authors writing about Chicago and its nearby neighborhoods, but few of them do it with such poise as Gint Aras. His writing balances bold flourishes with a plainspoken beauty, which was in full display in his novel, Finding the Moon in Sugar. In that book Aras completely embodies his pot-laced Andy Nowak in the first person narrative, right down to the slang written words and diction. It was a deep character study that asked you to see the world through his eyes and ears. Aras' second novel, The Fugue, released by Chicago Center for Literature and Photography, is an entirely different beast. It is a disorienting and multi-layered tale that interlinks refugee families, communities, and art over multiple generations. 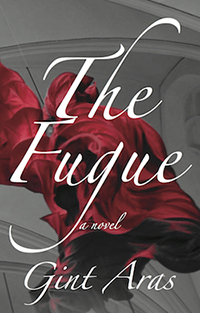 There aren't books immediately deserve a second reading, but The Fugue is one of them. The Fugue centers itself on an incident that tears apart the already vulnerable lives a close knit group of refugee families in Cicero. Yuri Dileineko, a young promising sculptor, is convicted for the murder of his parents, allegedly burning their house down while they slept, only to be released a little over a decade later. It instantly hooks you, leaving questions to the innocence of the quiet Yuri, only to abandon the present in favor of the past. The mysteries of the novel grow as the narrative jumps back through time and characters. The scope expands beyond the fire and into the lives of the generations that precede Yuri. While the mystery of The Fugue is intrinsically inviting and ultimately incredibly satisfying, I don't feel that is the true core of the novel. One of the more central aspect of The Fugue is more accurately seen in the complexities surrounding the refugee families and how they cope. Aras sets his tone immediately in the first chapter, detailing a character's traumatic experience in Western Ukraine. The short chapter captures many the book's themes and motifs so concisely that on my second reading I felt even more overwhelmed by it. Aras contemplates the consequences of the fear and abuses suffered by refugees. The Fugue rarely, if ever, pulls any punches. Aras has created damaged and intricate characters who don't fall prey to typical pastiche. If anything, he subverts expectations, leading characters down more personally gratifying paths. One the most interesting ways that Aras manages to illustrate his character's unique personalities is through distinct narrative shifts. One moment you in a scene of reality before being swept up by what are often dark and nightmarish prospects. The novel is filled with passages that feel like sudden fever dreams brought on by characters moments of fear, lust, and deep thought. These imagined moments happen sparingly, it is a high point in Aras' writing. His prose really shines during these sections, giving into them without hesitation. The scenes arrive unannounced and depart with just as little caution, leaving only a residue of their full intent of on the story. Another central theme that illuminates the core of the novel is music. Aras positions music in a complex realm just like his other characters. At times music is portrayed as a healing device, an outlet for pain and suffering. Other times it is the source of it, the initiator of uncertainty and malice. It's that contracting balance that defines the musical technique for which the book (partially) finds both its name and structure. Nearly everyone and everything in the book has the duality and repetitious quality of a fugue. Following this technique as subtly as Aras does allows for connections to be satisfyingly discovered as the story moves along, especially as Aras considers all meanings of a fugue. There are so many aspects of the book that remind me of other great writers. Aras handles Cicero with the same intimacy that Stuart Dybek does with so much of Chicago and its surrounding towns. The reverence and importance instilled on music (and other forms of art) and how it influences novel's shape beckons to the likes of Richard Powers' The Goldburg Variations and Thomas Bernhard's The Loser. There are even instances of Tolstoy and Dostoyevsky littered throughout the prose, but like all the previous elements I mentions, Aras never succumbs to them. The Fugue isn't an obscure patchwork of influences but a wholly complex original that demands to be read. Gint Aras will be celebrating the release of The Fugue this Thursday, Dec. 17 at City Lit Books, 2523 N. Kedzie Blvd. He will be discussing the fifteen year journey of writing the book as well as reading some excepts. Aras will be joined by world-class violinist Maria Storm for a short performance of a fugue. 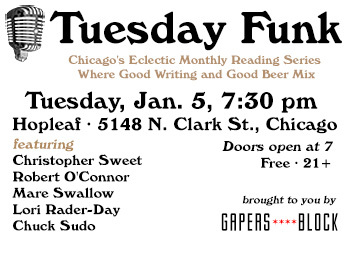 Word is he might stop over by The Owl afterwards for a few drinks if you want to have a conversation with one of the more interesting Chicago writers.